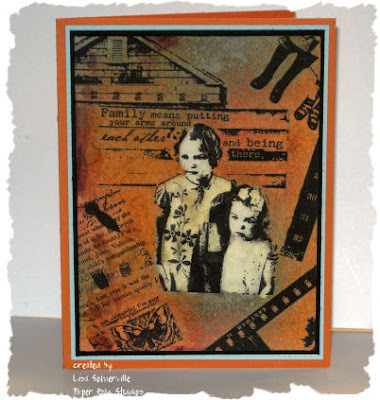 This weeks Bloggers Challenge was to use Orange and Black in creating a card or project. If you'd like to play along - leave a comment on this post with a link to your blog or gallery using this weeks challenge. Instead of using Halloween sets for this weeks challenge, I picked a few other stamps that I thought worked rather well with the colors we needed to use. Of course I couldn't resist adding a hint of color to my cards. Be sure to check out the other Bloggers Challenge Players Blogs - they're listed on my sidebar. Great cards this week Lisa. Love the new techniques in this issue of TJ Newletter. Your card really showcases how creative and versatile this technique is! Your cards are Fabulous Lisa. I love the Leaves............reminds me of the beautiful crisp and Sunny Weather we are having!!!!! more great cards Lisa!! love the leaves one - Fall is my fav time of year!! great guest card as well!! Lisa! I just love both of your cards! Adding a little extra color doesn't overtake the b/o combo at all! 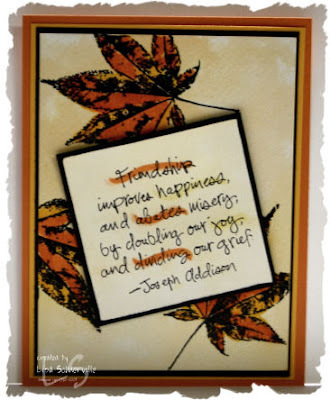 Love the leaves and on that card, I especially love the way you highlighted the words with orange. Anita the guest blogger...Great card! Thanks for joining us for the week! I can't decide which card is better -- they are both wonderful! Anita's card is great, too -- love all the details you put in there, Anita! 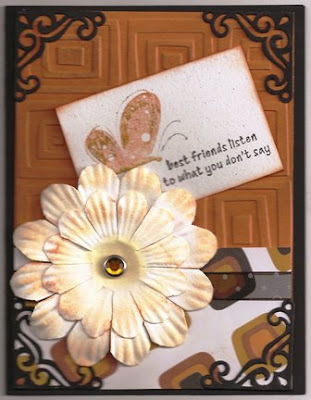 Lisa and Anita...all your cards are a great use of the Orange and Black combo! Love them! love all the card Lisa! WOW!Those samples are fabulous! I love the leaf card the most. You really captured that artsy collage look with the first. I struggle with that immensly!! Great cards Lisa. I like the leaf one best. So pretty. Love your cards! The leaves are my favorite--so pretty! Anita-great job on the challenge too. Thanks for being our guest. stunning cards - all of them! Happy Anniversary to you and your hubby!!! Great minds think alike, I added just a hint of color to mine as well. Great cards this week! All three are great! Picking images that would work well with the colors of the challenge was a good starting point. I love the look of the leaf card. Great cards Lisa! Those leaves are very striking! What a great technique. Neat orange and black cards, Lisa. I love how they're all so different!